Shrimp and scallop pie at Schooner Estates in Auburn. 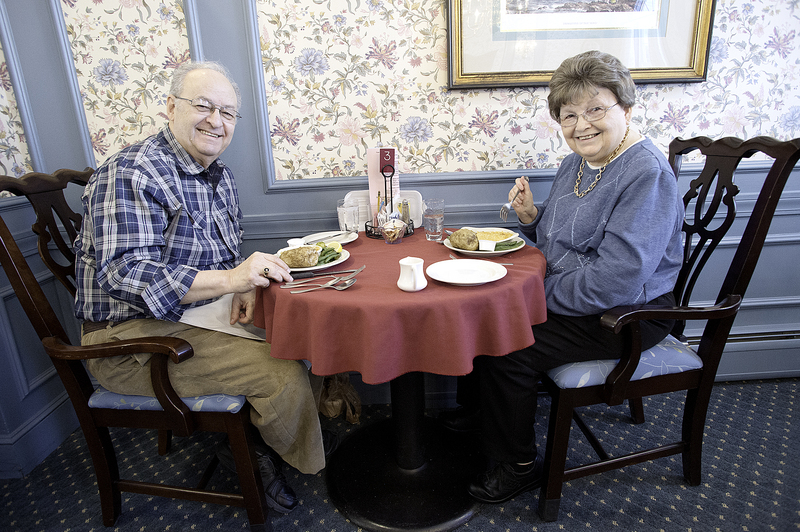 For years, the monthly restaurant excursions offered to residents at Schooner Estates were one of the most popular group activities at the Auburn senior living community. Now, says Schooner’s resident services director Mark Prevost, he has a hard time getting anyone to sign on for these trips. The reason? Tenants these days are loath to miss a meal at Schooner. Small wonder. For one recent lunch, a succulent shrimp and scallop pie was the starring entree, but anyone not enamored with shellfish could choose turkey stew or three-meat pizza instead. Side dish selections were mashed or baked potatoes plus brussels sprouts, green beans and mashed butternut squash – all freshly prepared. One could usher in the meal with either clam chowder or a tomato caprese salad: slices of fresh mozzarella and tomato perched on a bed of mesclun greens, dressed with delicate ribbons of basil and a balsamic glaze. Dessert options included cherry cheesecake. The mastermind behind all of this is Schooner’s head chef, Seth Lyons. 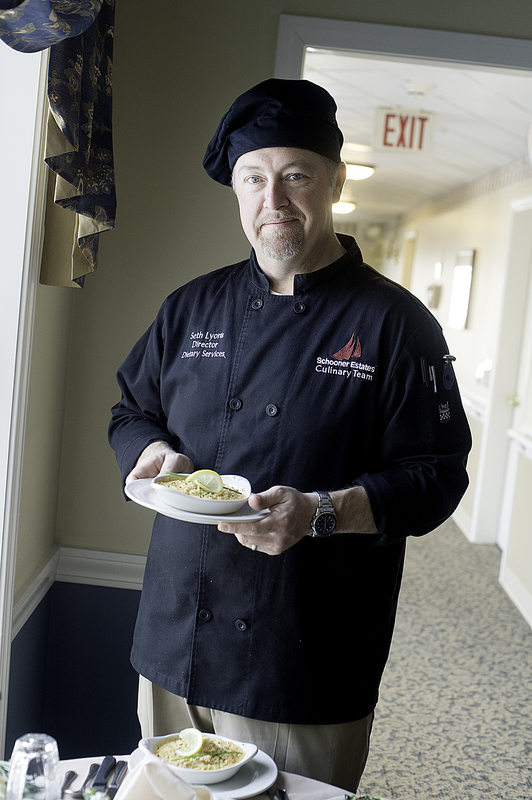 A 1996 graduate of the highly respected culinary arts program at Johnson and Wales University, Lyons spent several years first cooking at Maine coastal resorts, such the Asticou Inn of Northeast Harbor, and then at the Augusta Country Club before accepting a job as assistant director of dining services at Schooner in 2013. He took over as director in 2015. 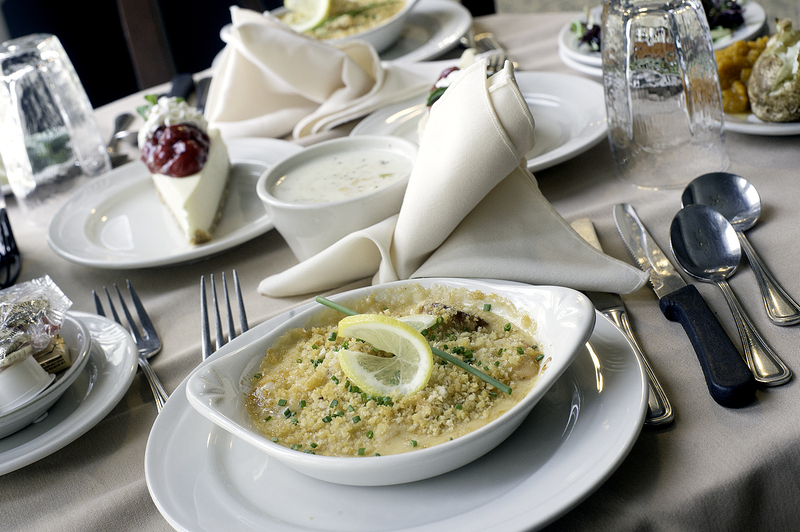 Lyons has always believed top-quality, fresh ingredients to be the secret to good food. “Things don’t have to be complicated to be good,” he says. He points to his shrimp and scallop pie, a simple assemblage of shellfish and sauce under a crumb topping. It doesn’t appear to be fancy, but after sampling a couple bites, this writer could imagine it coming out of the kitchen at a high-end gourmet restaurant. Chowder is another big favorite among Schooner tenants, with a variety of seafood and corn chowders all drawing enthusiastic plaudits. Credit here goes to another member of the culinary team, Brian Stone, who has earned a reputation as the establishment’s master soup-‘n’-chowder maker. And rightly so: His clam chowder – while simple – is definitely several notches above your basic offering, with a bounty of fresh clams, potatoes and celery bathed in a rich, velvety broth subtly infused with bay leaf and a hint of thyme. Other tempting dishes found on a typical week’s menu at Schooner include Dijon-crusted pork with herb gravy, chicken tortellini pomodoro, sesame-seared tuna steak, and beef tournedos with red wine and mushrooms. Lyons and his staff relish the chance to further flex their culinary creativity on holidays and other special occasions. Recently the kitchen let out all the stops with a Mardi Gras spread boasting over two dozen Louisiana-inspired items ranging from Creole potato salad and Cajun-rubbed roast sirloin of beef to shrimp jambalaya quiche and fried oysters with sauce remoulade. They even put a Southern spin on a couple of comfort classics with their gumbo pot pies and New Orleans macaroni and cheese, in which the pasta was enrobed in a sharp white cheddar sauce flecked with andouille sausage, tasso ham and red bell peppers. Schooner resident Beverley Heath was still kicking herself a week later that she hadn’t taken a second helping of the Mardi Gras mac and cheese. “It was wonderful,” she said wistfully. Seth Lyons, Schooner Estates’ director of dietary services. For the sauce: In a medium sauce pot combine the chopped shallots and sherry wine; cook on high heat until reduced by half. Add the lobster stock and heavy cream. Reduce heat and simmer for a few minutes, then stir in a cornstarch slurry (a tablespoon of cornstarch blended in a tablespoon of water) and continue simmering and stirring until the mixture has thickened sufficiently to coat the back of a spoon. Season to taste with salt and pepper. For the topping: In a food processor combine panko crumbs, chips and crackers and grind until a consistent-sized crumb is achieved. Drizzle the melted butter evenly over bread crumbs and mix to blend. Next, in a preheated saute pan on high heat, lightly brown the shrimp and scallops in the 2 tablespoons of butter, being careful not to cook the shellfish through. Remove from the heat and arrange the seafood evenly in four ramekins or other oven-safe dishes. Pour the sherry sauce over the seafood until it’s barely covered, then sprinkle generously with the crumb topping. Bake in a preheated 375-degree oven for about 10 minutes, or until the topping has started to brown. Garnish with lemon slices and fresh chives and serve immediately. Romeo and Theresa Labbe sit down to eat their shrimp and scallop pie at Schooner Estates in Auburn.